My pet feels warm to the touch. Does that mean he/she has a fever? How can I request a copy of my pet's medical records and/or diagnostic images? Can you tell me how much a certain procedure or workup will cost before seeing my pet? Which animals do you treat? What should I do if I found a stray dog or cat? Do you treat wildlife at CVRC? Can you recommend any pet friendly hotels near CVRC? Can you provide a list of hotels near CVRC if I need to stay overnight? If your pet is having an emergency, please come immediately to Charleston Veterinary Referral Center. Emergency veterinarians and veterinary nurses are ready to see your pet 24 hours a day, 365 days a year. You know your pet best, so if you’re concerned please call or come to CVRC. What are some common conditions/signs that require emergency care? What should I do if I think my pet is having an emergency or urgent condition? An emergency clinician is a veterinarian who has a special interest in emergency medicine and obtained additional training and experience in emergency medicine. Our Emergency/Critical Care Department is led by South Carolina's only Board Certified Critical Care Specialist, and we are the ONLY certified Level 1 Emergency Care Facility in the South Carolina by the Veterinary Emergency and Critical Care Society (VECCS) and one of a select few in the country. Our focus and expertise is on stabilizing and treating sick, ill, and critical patients with conditions such as trauma, toxin exposure, gastrointestinal disease, cardiovascular disease, immune mediated disease, pulmonary disease, neurologic disease, and/or metabolic disease, and returning them to good health and normal function whenever possible. Our hospital is open 24 hours a day, 365 days a year, including all weekends and holidays for emergency care. If you call after normal business hours, please follow the prompts to speak with an onsite staff member. Should I call before bringing my pet on emergency? I am not sure if my pet is having an emergency. What do I do? We are here to assist you and your pet whether you come into our facility or not. We have veterinary nurses available 24/7 to answer any questions you have. If you are unsure if your pet is experiencing an emergency situation, please call us and we can help determine the best course of action. There is no fee for this phone call. We encourage you to fill out our New Patient Registration Form to preregister in our system. This can help expedite your visit to CVRC. A specialty hospital does not offer any routine or preventative care. Our veterinarians have advanced training in specific disciplines such as emergency and critical care medicine, surgery, oncology, internal medicine, critical care, physical rehabilitation and neurology among others. We also have equipment that most primary veterinarians don’t have such as CT scans, MRI, endoscopic equipment, and specialized surgical tools. We work closely with your primary veterinarian to offer these services to you. What should I expect initially when I bring my pet in for emergency care? 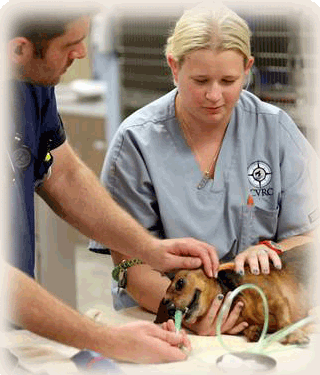 Initially on presentation, a veterinary nurse will come and greet you and your pet. They will get a brief history from you, obtain your pet's vital signs, and report this information to our emergency clinician. While we make every effort to see patients in the order they arrive, patients are seen by our doctors based on severity of condition, not always on a first come first serve basis. Upon arrival, you will be asked to fill out a patient registration form. Depending on your pet's condition, you may be asked to sign an initial emergency consent to allow for initial treatment and stabilization of your pet. The doctor will perform a full examination of your pet and formulate a treatment plan with you. We will communicate with you about the status of your pet routinely during the hospital stay and encourage you to contact us for updates or with any questions or concerns. Also, we will communicate with your primary veterinarian during this process to ensure a collaborative treatment plan for the care of your pet. At the time of discharge, you will be given a printed visit summary with the diagnosis, treatment recommendations, and follow up care for your pet. A full report will be sent to your family veterinarian as well. We welcome your progress reports, questions and concerns any time and will maintain an ongoing relationship with your primary care doctor to ensure the best experience for you and the best care for your pet. What should I bring to the emergency visit? Please bring your pet and a list of all medications, strengths and dosages, or the pill vials that you pet is currently taking. We can request medical records from your primary veterinarian once you arrive (or prior to arrival if you are being referred or transferred by your regular veterinarian during normal business hours). Do I need a referral for emergency care? You do NOT need a referral for emergency care. Pleased contact us or come to CVRC if your pet is having an urgent or emergency condition. If your pet is being transferred or referred by your regular veterinarian for emergency or continued care, please bring all pertinent medical records, laboratory work, and diagnostic images. We can help obtain these from your family veterinarian as well once you arrive. We work closely with your primary veterinarian and ensure they receive copies of all medical records. We also communicate via phone and they have the ability to access a portal into our medical record system. How much does it cost for an emergency examination? Our emergency examination fee is $85.00. After an assessment by our doctor, you will be provided with a detailed medical plan including all costs recommended and anticipated. You and our doctor will review this and determine the best course of action for you and your pet. What types of animals do you treat? We predominantly treat dogs and cats. If you think you are having an emergency with a different species, please contact us via phone for advice. Will my pet need to stay overnight? Depending on the nature of your pet's disease or condition, the diagnostics or treatments performed, and their timing, your pet may or may not need to stay overnight. Many conditions can be treated on an outpatient basis. Our doctor or veterinary nurse will discuss the expected hospital stay during your visit or admission to the hospital. All patients have round-the-clock care. We always have doctors and veterinary nurses on premises to monitor and care for your pet. No pet is ever left unattended. Can I visit my pet while they are hospitalized? We always allow owners to visit with their pets. Please call and speak with your doctor or nurse so we can coordinate a time that is best for your pet and you. We try to limit visits to twice a day for 15 minutes as to not interfere with your pet’s treatment. It is generally discouraged to visit on a day when your pet underwent general anesthesia as sometimes this can be disruptive to their recovery. If you feel there is an extenuating circumstance, please discuss this with your doctor. When is it best to call to check on my hospitalized pet? It is best to call after 10 am to receive an update. The doctors are in rounds from 8 am - 9 am every morning. After rounds, every patient is examined by their doctor. If the situation warrants, we will call you before this time. Can I bring special items from home (blankets, tee shirts, toys, etc.) to keep with my pet during their hospital stay? Yes, you are welcome to bring things from home to make your pet feel more comfortable. Please note, however, we cannot always guarantee the return of these items as they may get soiled, lost or damaged. Should I bring my pet's prescription medications and/or prescription food when my pet is being admitted to the hospital? In an emergency situation, the priority is for you and your pet to get to CVRC. Once it is determined that your pet is going to be hospitalized, you may bring all prescription medications your pet is currently receiving. We carry most common medications if this is not feasible. Our doctor will determine if these should be continued during your pet's stay. We have a full range of diets to feed our hospitalized patients. However, if your pet is on a prescription or special diet we will gladly feed that if you provide it for us. What should I do if my pet ingested a toxic (or potentially toxic) substance? Please call us, or your regular veterinarian, immediately. Depending on the toxin there may be steps you can take at home to minimize risks to your pet. Sometimes, we may recommend you call an animal poison control hotline. We recommend the ASPCA Poison Hotline at (888) 426-4435. More information can be found at: ASPCA Poison Control . Is it normal that my pet has not had a bowel movement after being hospitalized? It is common for pets to not have a bowel movement for the first 24-72 hours after returning home. However, this is not the case with all conditions so please refer to your discharge instructions. The changes in their defecation pattern are often due to a different eating schedule in the hospital and some medications can contribute to this. If you are concerned, your pet seems uncomfortable, or is trying to defecate but is unable (straining) please call us. Is it normal that my pet has been urinating more frequently after being hospitalized? It is common for pets that were on IV fluids to have increased urine production. Therefore, they may need to urinate more frequently. This may last for 24-48 hours. If they are straining or not producing urine, please call us immediately. Is it normal that my pet has not urinated, or is having trouble urinating, after being hospitalized? This is not normal as most animals will urinate within 24 hours of returning home. If your pet is not urinating, or having difficulty while urinating, please call us immediately. Is it normal that my pet has slept all day after being hospitalized? Pet's sleep cycles in the hospital environment are altered so it is not uncommon for them to be tired when returning home. This may last for 24 hours. If your pet appears listless, unable to ambulate, or you are concerned please call us. Will my pet need to wear an e-collar (lamp shade type) after returning home from the hospital? An e-collar prevents a pet from licking an area we want to protect until it is healed. This may be a wound, irritation or an incision. Please refer to your discharge instructions for specifics. When do my pet's sutures/stitches need to be removed? Generally we remove sutures 10-14 days post placement. Please refer to your discharges instructions for specifics. Do I need to pay to have my pet's sutures removed after having surgery at CVRC? Suture removal is done complimentary for all patients that had a surgical procedure. If further procedures (X-rays, bandage changes, additional diagnostic tests, etc.) or additional medications are indicated there will be applicable fees. Not necessarily. Dogs and cats have a higher body temperature than people so they often feel warm. You can purchase a rectal digital thermometer (doesn’t need to be animal specific) and obtain your pet's rectal temperature. This is the most accurate assessment. Normal temperature for dogs and cats is 99.5—102.5 degrees Fahrenheit. Please bring the animal directly to the animal shelter in the county it was found. If these shelters are not open, you may bring the stray animal to CVRC and we will facilitate transfer once they open. We cannot accept any stray animals during times the shelters are open. We do not treat wildlife at CVRC. If you find an injured wild animal, please contact one of the following rescue groups right away.Each has an emergency hotline. Leave a message and they will call you back.